Enjoy a Northern Indiana Sleigh Ride! The lyrics to “Jingle Bells” are all about it but – have you ever ridden in a one horse open sleigh? Now you can with a Northern Indiana Sleigh Ride! It sounds almost like something out of a fantasy or from a time now long since passed – bundled up, perhaps under a thick blanket, the cool, fresh winter air in your lungs and on your face, the jingle-jangle of the tack and the hiss of the sleigh runners as they cut through the snow on the forest path – I can see it in my mind’s eye and now I’m all ready for that return-home hot cup of cocoa by a warm fire – and so can you be, too! If you’ve never ridden in a one horse open sleigh, you’re in for a real treat. Hayrides and sledding don’t compare. There’s nothing like an old-time, one horse open sleigh ride and here’s the best part, you can take a Northern Indiana sleigh ride even if there is no snow because this sleigh can be fitted with wheels – so don’t let a lack of the white stuff on the ground keep you from booking your Northern Indiana Sleigh Ride! Now for the best part – your Northern Indiana sleigh ride can be had as part of a package deal through us: Scottish Bed & Breakfast! Just let us know you’re interested when you’re booking your room and we can discuss the details. Want to add it onto another special? No problem. Want it as a stand-alone treat? You’ve got it! 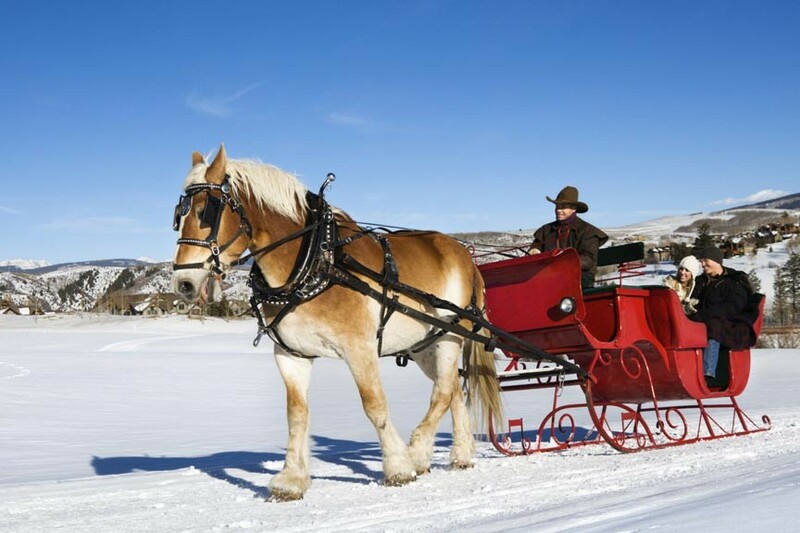 We’ll bundle the cost into your stay with us, so go on, give yourself and your loved one an experience of a lifetime this with a one horse open sleigh ride! No matter what time of year you come, Scottish Bed & Breakfast is your home away from home for all your Northern Indiana adventures! Whether it’s enjoying an Amish dinner in the summer, taking in flower carpets in the fall, or going sledding in Mishawaka’s Wilson Park in the winter: we’re always here with a warm bed just for you! This entry was posted on Saturday, December 20th, 2014 at 10:00 am and is filed under FUN Things to do in Bremen. You can follow any responses to this entry through the RSS 2.0 feed. Both comments and pings are currently closed.